Graphs at a glance: Who's afraid of affordable housing in London? London councils take money from developers in lieu of affordable houses. "I want to make sure we are all in it together, as part of the recovery, which is why I want to see above-inflation increases in the minimum wage, precisely because the British economy can now afford that." "The price of this financial crisis is being borne by people who absolutely did not cause it…..Now is the period when the cost is being paid, I'm surprised that the degree of public anger has not been greater than it has." Mervyn King, Governor of the Bank of England, in evidence to the UK Parliament’s Treasury Select Committee, March 2011. 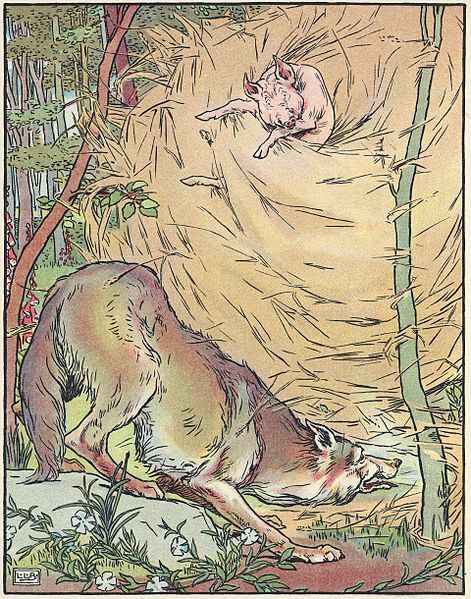 Of course, it is unfair of us to compare Osborne to the big bad wolf. Let me say that now before the complaints come tweeting in from wolf lovers across the globe. 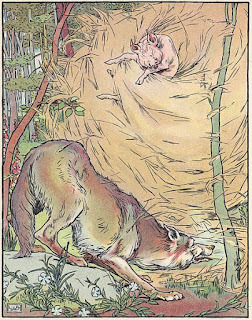 All the wolf wanted was a meal, while Conservative Party policy is after much more than that. 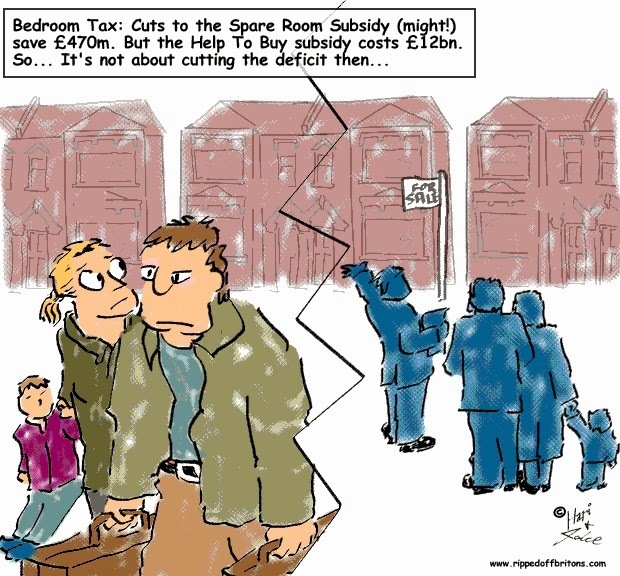 Tory policies on benefits caps and bedroom tax seem designed to drive unsuitable people from suitable areas. According to Shelter, the housing charity, the way people are kept below the overall benefits cap is cutting housing benefit. The effect of which is to push them out of their homes. However, it is not enough to drive away all the unsuitable people from the suitable places. What about getting rid of the unsuitable properties? A report by Westminster Council shows the difference in expectations is between the well-heeled and the down-at-heel when it comes to the size of their gaffs. The Westminster report states a ‘Social’ 2 bedroom flat is 750 square feet, while a private ‘Society’ 2 bedroom flat is 1,200 square feet. A ‘Social’ five bedroom house, at 1,760 square feet, is smaller than a ‘Society’ three bedroom flat. And you can fit twenty one ‘Social’ one bedroom flats into a single ‘Society’ five bedroom house. Now this is not just a question of ghastly neighbours. Think of the ghastly voters! Imagine the effect on 50 years of uninterrupted Tory held councils in Westminster of having 21 poor families voting from their one bedroom flats when you could have one wealthy family’s votes from their 5 bedroomed residence. The thought alone would jangle any numerate Tory's boodle. "use their evidence base to ensure that their Local Plan meets the full, objectively assessed needs for market and affordable housing in the housing market area.."
"unless off-site provision or a financial contribution of broadly equivalent value can be robustly justified"
A Freedom of Information request by the Bureau of Investigation found that three London councils have been making extensive use of this pay-off option: Tory Westminster, the City of London and pretty solidly Labour Southwark council. Perhaps we are being unfair, and it is the nature of big cities that their centres aren't appropriate for the poor for some complex reason. And the poor would actually be better off in a more far away location. However, the Bureau of Investigation's investigation reveals that other big cities in the UK do not find this an issue. Payoffs in these other cities barely register. Social cleansing. Slow genocide. The undesirables are being ushered away, to make it appear that poverty doesn't exist. The great unwashed become the unseen, they don't exist therefore, the problem no longer exists. Why the hell should social housing be placed in areas that people who work cannot afford? Move 'em out, provide an incentive to join the rest of society. Better still, end the social housing programmes altogether. Generations of families have lived in London for decades when homes were more affordable, through no fault of their own business in Britain is centralised to the South East, most of this in London, combine this with the lack of new builds property prices have become over inflated, this is a national disgrace & is social cleansing! A home should be a basic human right, not a business investment. To reduce housing benefit, property prices need to be reduced & in order to achieve that there needs to be a cohesive homes building plan in London & the whole of the United Kingdom. Although it's Christmas, I'm inclined to hope that you lose your job, and no help is available. Being badly paid isn't a crime, but being a 'banker' [some confusion about the first letter of that word] usually is. Lol don't you just love this country and it's compassion, fairness, freedoms and justice. Only unemployed people live in social housing? What a blinkered idiot. Obviously don't watch any 'real' documentaries about families having to actually give up there jobs because social housing is removed. Then they are dumped on benefits somewhere else and called scroungers. Bloody awful country with some bloody awful people. Wish I'd been born somewhere else ashamed to call this home. There is a two tier system in play here. Small sites (9 units or less) must pay a charge in lieu if no affordable is provided on site. Larger sites are negotiated and the developers favourite con-trick, the "viability assessment" is used to support high land values in place of affordable homes. These Assessments are never made public and are exempt from FOIA requests because they are deemed commercially sensitive. This is nonsense. They shuld be a "residual" valuation. Value, less profit less cost = land value, but Councils get duped all the time. My own just recently granted consent for 78 flats with no affordable at all and not a penny in constributions towards affordable off-site. Guess what, the developer was a joint venture between the land-owner and the builder. No danger of any sort of fiddle there, obviously not! The whole system need root and branch reform. Define "affordable" properly, set a percentage of value you want to capture, capture that in a Community Land Trust. Until we stopp letting developers overpay for land then force Councils to let their own policies be compromised to pay for their exuberance, this will go on and we will not get th eaffordable homes we need.